Experience Regents Canal like never before with this fantastic tour of the picturesque sites of London. WIth an experienced BCU tour guide, you'll be out exploring the canal. 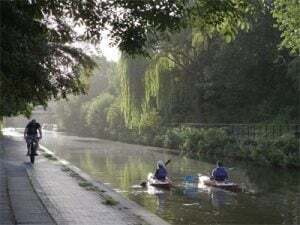 This magnificent Regent's Canal tour gives you a great opportunity to enjoy the sights of London whilst indulging in the sport of Kayaking.Seeing the sights of central London from a kayak is an unusual and exciting adventure. 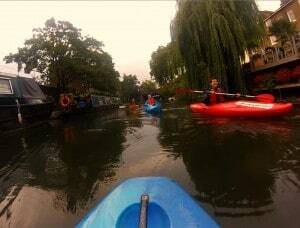 Paddle along in your own kayak on Regents Canal passing Regents Park Zoo towards the buzz of Camden Town and the old English Camden lock. Get up close and personal to the Giraffe House and Snowdon Aviary from your very own first class seat.The experience will last 90 minutes and will start with a full safety briefing.Your fully qualified British Canoe Union Instructor will then take you along Regent's Canal on an unforgettable adventure!Once you have arrived and been welcomed to the centre, either just before sunrise or just before sunset, your Thames River Kayak experience will begin by meeting the instructors and getting into your gear for the day. The Regents Canal Tour will then begin (and end at) Primrose Hill Bridge as you, the group and the BCU qualified instructor paddle towards Camden Town passing by a range of fantastic landmark sights, such as London Zoo, Snowdon Aviary and the Giraffe House. 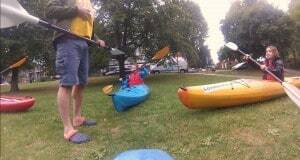 You will also pass Cumberland basin and head towards Little Venice, the Royal Park of Regents Park and Lords Cricket Grounds on this wonderful River Thames Kayaking journey. The kayaking experience is available from sunrise - sunset on selected weekends between March and October. Please note, dates are subject to availability at the time of booking. 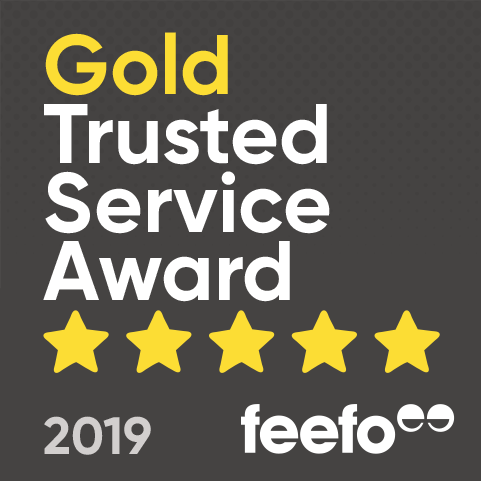 If you would like to check availability for a specific date prior to redeeming, please feel free to give our customer service team a call. Minimum Age: 9 (children under 12 must be accompanied by a participating adult). Participants must be able to swim 20 metres, although the nature of the kayaks and experience will not require rolling out of the kayak. If you have a disability or medical condition please inform the centre at the time of booking. Expectant mothers are not permitted to Kayak at any stage of their pregnancy. The kayaking lasts 90 minutes, but expect to be on site for longer. Please ensure you arrive at least 15 minutes prior to your start time - tours leave promptly. 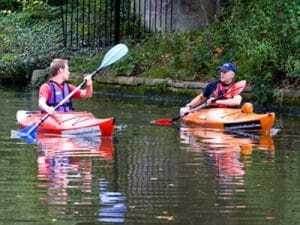 Participants: The Regents Canal Kayaking - London is for 1 participant. (if you are a small group, you will simply be added to another group booking). Spectators are welcome to watch, and can even stroll along the footpath beside you! All equipment is provided by the venue. Participants should wear warm clothes and sensible shoes, and bring a spare change of clothes. In particularly adverse weather conditions the experience may be cancelled, in which case it will be rescheduled for another date. The instructor was very lovely and we had a lovely time on the canal. However, I wonder which century we are still in. The canal was filthy and as we proceeded towards Camden town it just got worse. There is a point where under a bridge there is a great collection of sewerage waste with loads of glass bottles and cans floating around. The instructor took us under the bridge and had it been clean I would have loved the adventure in the dark. However I'm very disappointed that I had to see and smell what I saw and smelt! Would recommend London Kayak Tours for its own merits. Lovely company. However No One answers their phone. They ask you to leave a message but the beep doesnt come before a full five minutes or so. Please change that and provide an active contact for the day out. 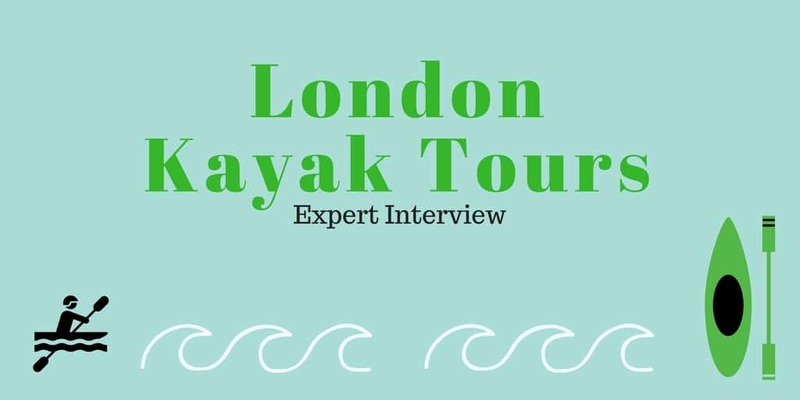 Abby and I were very excited to embark on a Kayak Tour down the Regents Canal with London Kayak Tours. Both of us were complete novices to Kayaking. I had never been before and was slightly apprehensive about how easy it would be to pick up, balance and steer. Our evening began with a brief introduction from our instructor David (qualified at the British Canoe Union). We laid out our boats on land and positioned ourselves in the Kayaks were we proceeded to show David our best paddling techniques. The introduction was brief and informative as David wanted us to have maximum time kayaking! After all gracefully sliding into our boats (with David’s help) we started heading downstream. The streamlined boat was easy to navigate and balance. As we glided further down the canal, I felt secure in my boat and gradually felt more confident to speed up my pace. Our tour began at 7.30pm; forming a cool picturesque evening that truly transported us away from the hustle and bustle of London’s concrete jungle. The Tour started outside Regents Park Zoo; with the zoo right next to the embankment, we were soon greeted with the chirping of birds and the chatter of monkeys as we skimmed past their outdoor aviary and cage. Our bird watching continued as the evening commenced – an array of moorhens, ducks and swans swam closely by us. The two acre urban nature reserve is a hidden gem in one of the most densely populated parts of London. By travelling on a canal, I was able to see London in a unique perspective that enhanced the natural beauty of such a peaceful landscape. David was an excellent guide; he was personable and undeniably passionate about the tour. David provided us a fountain of knowledge and interesting anecdotes of the various landscapes on the 8 mile route including the old English Camden lock and the Giraffe House. On a personal level, one of the great joys in my job is working in an industry where people are simply doing what they love. I think this is an unfortunate rarity in our current society; Kayaking with an expert was both humbling and inspiring. David started the business from one kayak he bought at an auction for £100 and since the business has blossomed. Our group of four also included two lovely South African girls who both had a thrill for adventure and loved the experience just as much as we did; subsequently booking a big group kayak session for them and 10 others! This experience is universal, and is perfect for all ages and group sizes with no prior experience needed. As the sun began to set so did the evening, drawing to a close with a glass of champagne in our hand and the scenery masked by twilight we enjoyed the last of our spectacular views by kayak. Check out the Tour we also offer at Windsor.